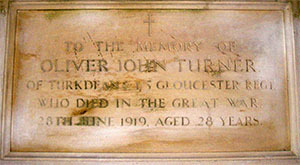 Located in All Saints Church, Turkdean, Gloucestershire, is a small wood framed paper Roll Of Honour and a memorial to Oliver John Turner. 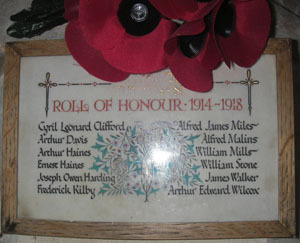 The nearby small villages of Hazleton and Hampnett do not have war memorials, nor a RoH on display in the church. 28TH JUNE 1919, AGED 28 YEARS. [Note: Date of death 28/6/1919 is correct, and he is buried in the churchyard].